Operates on AC voltage or internal battery & charger. Battery capacity is indicated on the monitor screen. Two signals indicate readiness: a ready message display and audible tone. Can be used for both short and long term monitoring. 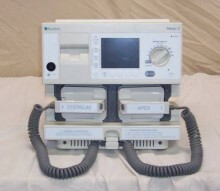 Defibrillator paddles can provide a quick assessment of patients condition. ECG data appears on a EL screen. 4 seconds of continuous waveform data,lead selection,heart rate,date,time,battery status, gain and filter setting all displayed on screen at one time. Click the button below to add the BURDICK MEDIC 5 Defibrillator to your wish list.